Natural history museums can only display a fraction of their treasures. The Burke Museum is no exception. It has more than 11 million preserved fish specimens from around the world, though many of them hail from the North Pacific Ocean, Bering Sea, and Pacific Northwest’s freshwaters. 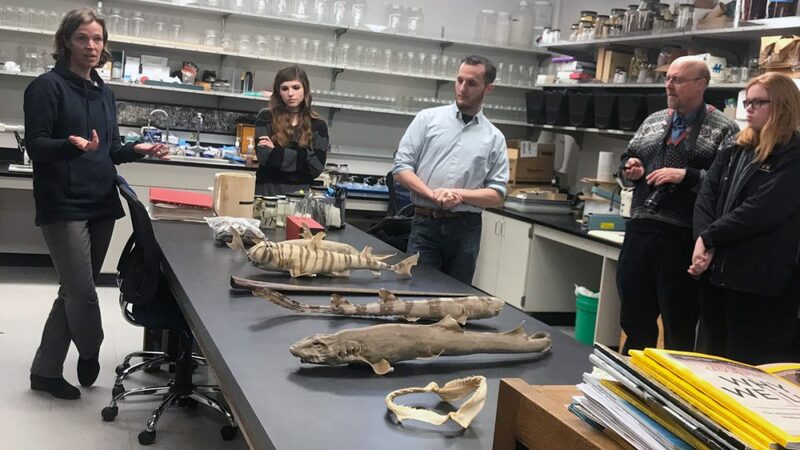 On Feb. 27, members and guests got a behind-the-scenes (and behind-the-jars) tour of the Burke Museum’s Ichthyology Collection, housed on the University of Washington campus, and saw the largest fish collection in North America. This hour-long tour was led by the museum’s ichthyology collection manager Katherine Pearson Maslenikov and the museum’s curator of fishes and UW fish biologist Luke Tornabene. On the tour, we peered into what Tornabene called their “bucket of horror” and glimpsed the stranger side of fish evolution, while also learning about how the university puts museum collections to work in research today. Afterward, we gathered for drinks and discussion at the College Inn Pub.